Motorcyclists need a special kind of GPS device if they require mapping and navigational assistance. Dedicated GPS devices and smartphones are pretty reliable these days but they are not designed to be mounted on motorcycles. This is why companies like Garmin created a separate category for motorcycle owners. The challenge is to make reliable GPS navigator in a small form factor so it can be securely mounted on a motorcycle. It should also have superior build quality to protect the gadget from harsh elements. Lastly, the core functions shouldn’t be sacrificed. 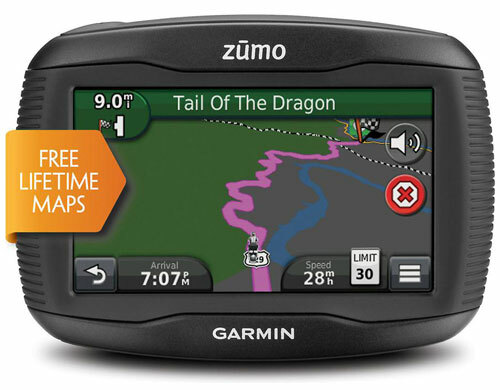 The Garmin zumo 390LM exceeds these needs and raises the bar in GPS navigators for motorcycles. The question is whether or not the enormous price tag is worth the purchase. The Garmin zumo 390LM played it safe with the design and stuck with the design of its predecessor – the Garmin zumo 350LM. That is fine because the rugged look really has that Garmin aura and it should match well when mounted on bikes. The exterior is fully resistant to UV and fuel. Plus, the GPS navigator is fully waterproof up to a meter deep so those heavy rain situations shouldn’t cause any problems. It has a 4.3-inch touchscreen display putting it in-line with the automotive Garmin nuvi devices. Still, the device is very compact and travel friendly.The touchscreen is specially designed to work without the need of taking off your gloves. The Garmin zumo 350LM is a fantastic GPS navigator and it still is today but the zumo 390LM adds even more value by adding 3 major features. The first feature is a fuller form of the Bluetooth connectivity. Nowadays, even midrange automotive GPS navigators have built-in Bluetooth to allow the navigators to pair with smartphones so text messages and calls can be relayed to the screen. It is only fitting for the Garmin zumo 390LM to have this feature considering the price. Now you can keep your phone connected and answer any important phone calls without taking out your phone. The Bluetooth feature isn’t just about smartphone connectivity either as it works with headsets and any Bluetooth-enabled helmets so you can conveniently hear turn-by-turn directions in full clarity. The second new addition comes in the form of a new Calculation Mode option called “Curvy Roads” which simply augments the route algorithm to focus more on winding routes. It can potentially be used with the “Avoid Highways” option to generate a backroad route. It is fairly basic in function but a great addition nevertheless. You also have the “Shorter Distance”, “Faster Time” and “Off Road” options which open up other possibilities in reaching your preferred destination. The third new feature can only be utilized if you have the required two sensors and tires with metal valve stems. Called the Tire Pressure Monitor System, this feature simply keeps track of your tire pressure. All you have to do is set your preferred tire pressure and the threshold for low-pressure. Then you will get a warning on the zumo 390LM whenever the tire pressure falls below that threshold. These sensors boast pretty long battery life (300 hours) and are automatically put to sleep mode to save battery life when you turn off the GPS navigator. All the features found on the Garmin zumo 350LM are present in the Garmin zumo 390LM so you don’t get a compromised experience. It shares the same interface as the one featured in Garmin nuvi products so navigating through the interface is very simple even if you never used a Garmin product before. You also get to use Garmin’s Lane Assist with Junction View feature which can help a lot if you frequently go through highways and need to know when you need to be on the right lane before making that critical exit. It also features lifetime map updates which entitles you access to the latest maps as soon as Garmin releases them on their servers. This feature is completely free requiring no subscription. Other cool features include compass functionality and a TracBack tool which should prevent you from getting lost. The Service History Log feature further helps by keeping track of your tire mileages, oil changes and other bike maintenance operations. The numbers of miles traveled is recorded as well and you can use it as reference for determining if a fuel stop is necessary. While $699 is a huge price to pay for a 4.3-inch GPS navigator, the Garmin zumo 390LM is not more expensive than its predecessor when it first came out. The Garmin zumo 390LM is what the zumo 350LM should have been and it secures itself as one of the best GPS devices for motorcycles. You might be able to find the zumo 350LM at a cheaper price but the full Bluetooth functionality is enough to highly recommend this particular Garmin zumo product.